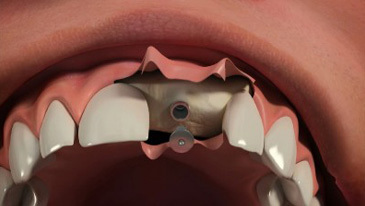 An dental implant is a small titanium fixture placed into the jawbone in the place of a missing tooth. It is usually left in for some time to integrate – that is for the bone cells to grow to the metal surface so that it becomes fused to the jaw bone. Once established it can then act as a new artificial root from which you can build naturally looking crowns and bridges to replace missing teeth.